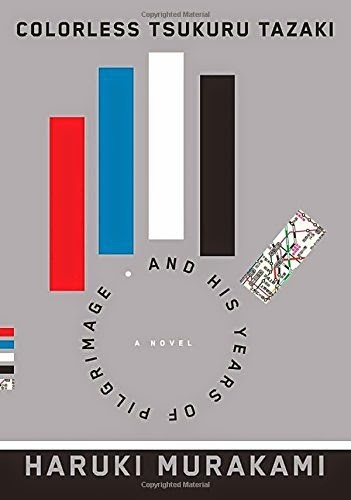 Finding the new Haruki Murakami book, 'Colorless Tsukuru Tazaki and his Years of Pilgrimage', waiting on the doorstep on my return from holiday has inspired me to write my first Author Spotlight post. Hopefully there will be more to come should I feel equally as inspired. I have actually been too busy reading the book to write this post until now, attempting to savour the novel rather than binge read the hell out of it (very much against my nature when it comes to Murakami). I thought the best way to assess the Murakami situation was to highlight all of his books and write a mini 'un-review' for the ones I have read. I am so glad I have yet to read my way through his back catalogue, as my Amazon wish list would be so lacking without them sitting there. Again, they are there to be savoured not binged through. I suppose one day seeing them all on my bookshelf will also be a pretty nice feeling. Hear the Wind Sing/Pinball, 1973 - Two books you say? His two first books to be exact, published in 1979 and 1980 respectively, and the start of what was to become the 'Trilogy of the Rat'. These two books are out of publication and difficult to find in Japanese let alone English, with translated texts currently on eBay for hundreds of pounds! Apparently Murakami isn't hugely proud of his early attempts at writing, and we are unlikely to see the reappearance of these books any time soon. I might hunt for pdf versions online one day for posterity, but reading them this way wouldn't give me the pleasure of a 'proper' book. 'A Wild Sheep Chase' completes the 'Trilogy of the Rat' (with the book 'Dance, Dance, Dance' included in the series to a lesser extent), and is considered Murakami's first real novel. A Wild Sheep Chase - The first real novel, and the last part of the 'Trilogy of the Rat'. Despite being his oldest novel, it is my most recently read Murakami, read my review here. What an introduction to the literary world - pure originality. Hard Boiled Wonderland at the End of the World - A surreal book with a split narrative between an other-worldly dreamscape and a hi-tech reality, its hard to believe this was written in 1985. We follow the protagonist as he makes his way through the dream world back to reality (if it is reality) whilst keeping ahead of the antagonists. This sounds familiar because it has since been done a thousand times, but you will not find a better or more original version of this old chestnut (again, it was written in 1985!). 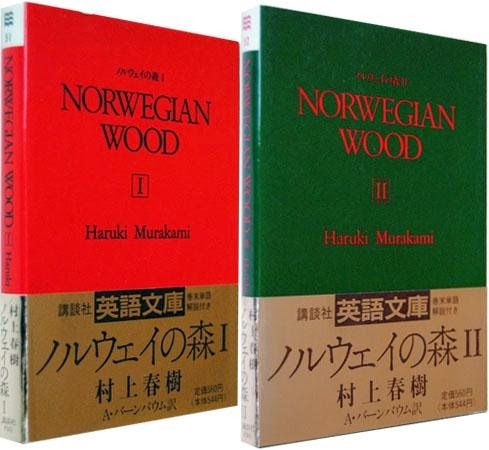 Norwegian Wood - By far his most loved and revered work, and its a real beauty. It was this that really made a name for Murakami in his native Japan, with people apparently queueing around the block to get their hands on copies. The book was released in two sections in Japan, one red and one green, to add a bit of drama to the book launches I assume, it bloody worked though. This was the first Murakami book I read and, for me at least, is his least surreal novel by far and maybe his most affecting. A good first foray into the authors world, it is a gorgeous, simple, devastating read. Dance, Dance, Dance - I have yet to read this one. The book is sometimes referred to as part of the 'Trilogy of the Rat' as it is set within the same world, and exact same hotel, as 'A Wild Sheep Chase'. I have read the book synopsis but I feel it may ruin the end of 'A Wild Sheep Chase' to mention too much, so I won't risk it. South of the Border West of the Sun - Unread. The synopsis, small town boy meets broken girl, seems vaguely reminiscent of 'Norwegian Wood', which may be the reason it has sunk to the bottom of my Murakami 'to read' pile - there can only be one! The Wind-Up Bird Chronicle - Another one on my TBR pile, and reading online reviews tells me that this book divides opinions, with very little middle ground. I have no doubt that a fan of Murakami, someone who really loves and relates to the way he writes (like myself) would enjoy the book, but maybe a first time Murakami reader shouldn't start here. Maybe people have come to expect surrealism and more fantastical elements from his books, and are freaked out my simple, well written 'real' literature when it hits them? I always think Murakami does straddle this literature/genre fiction line beautifully, but he isn't everyone's cup of tea. Sputnik Sweetheart - Unread, but probably next on my 'to read' list. This book is in the same vein as 'The Wind up Bird Chronicle' - with an alternate world used as a plot device - and appears on the surface to be 'classic' Murakami. Reviews of this book indicate a dislike of these 'typical' Murakami books by those who have read his 'pure' literature first, so again it seems people aren't appreciating his knack of straddling fantastical surrealism and beautifully written prose. Kafka on the Shore - A complex, interesting read about the interrelating adventures of two protagonists - Murakami at his best. This is, with Norwegian Wood, his best reviewed novel with good reason, and would be an ideal starting place for a Murakami virgin. This book displays Murakami's speciality, the knack of writing a book that is a wholly original page-turner and that is simultaneously gorgeously written and oddly calming and peaceful. Amazing. After Dark - This one is a little oddity, and a lot readers seem to not 'get' it. The best way to describe it is with a line I have stolen from someone else's review (Sam J. Ruddock on Amazon) - 'After Dark is the distilled essence of everything Murakami has ever written' - and I could not have put it better myself. The book is set over the course of one single night in Tokyo and is somehow about nothing and everything, a very short novel where every word counts and every subtle scene is perfectly set. 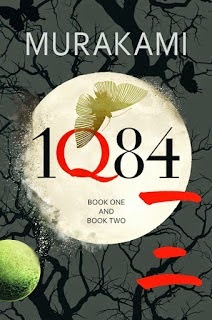 IQ84 - Lots of these books are amazing, some of them are merely great, and this one is my favourite. Its a real epic fantasy following two intertwined people in a parallel modern world with two moons. It is so warm, magical and unpredictable, yet feels so Japanese and pristine at the same time. Dipping into the book (which is very hard to put down) is like sinking into another world, where you somehow feel both comfortable and confused at the same time. Just writing this makes me feel like re-reading the book (or books depending on your edition - there are 3 books really) and ignoring everything else on my bookshelf. Colorless Tsukuru Tazaki and his Years of Pilgrimage - Newly published and just about finished by me. This was the first Murakami book I had the pleasure of pre-ordering and waiting patiently for on the release date - the joy of getting a new hardback delivered is pure bliss. I am going to fully 'review' this book next week, but rest assured it is well worth a read. I have to say it is not my favourite of his books and did not chew me up and spit me out in quite the same way as IQ84 - but then again not many books do. Other - 'The Elephant Vanishes' and 'After the Quake' are both books of short stories, which will remain at the bottom of my Murakami TBR pile as all short story books do in my opinion. 'What I Talk About When I'm Running' is an autobiographical memoir/travelogue/running guide which I really enjoyed reading, but not in the same was as his fiction and I find non-fiction so hard to review. He is an interesting man who writes beautifully so every book is worth a read!